Sometimes a performance is much more than just an performance. On rare ocassions a performance is actually a theatrical event. This happened last Monday night at the Robert P. and Salua J.A. 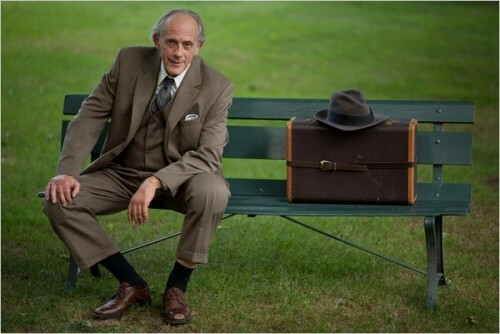 Smith Theatre at Roxbury Latin School in Boston with the distinguished American character actor Christopher Lloyd starring in Arthur Miller's Death of A Salesman. Founded in 1645, Roxbury Latin is the oldest continuously operated private preparatory school in North America. Through generous alums, in the past few years Roxbury Latin School has had actor Charles Holt, actress Kate Burton, actor/director Roger Reese, poet laureate Billy Collins and jazzman John Pizzarelli as artist in residence to interact with the students and faculty. This production of Death of A Salesman is the first time a full scale professional production has taken place at the school. This sterling production, polished in every way, was a precedent-setting theatrical event establishing a foundation for this venerable school to become not only a center for training young male scholars, but for it to become a serious cultural center and theatrical training ground. The play itself was magnificent. Not only was Mr. Lloyd's, but all of the actors' performances were wonderful. 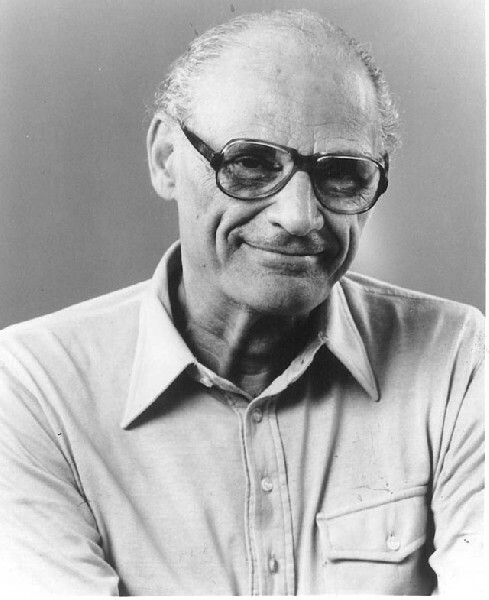 Arthur Miller's Death of A Salesman is not the easiest play to watch or enjoy. Most of us read it in high school. It is troubling both conceptually and in terms of the characters. It made us think and analyze. Emotionally charged and very compelling, the play is about the few ups and many downs of the Loman family--father Willy, mother Linda and sons Biff and Hap (Happy). All in their own way are ner'dowells. This is a story of potential unrealized, the American Dream as false premise and dillusional notions of what should be rather than what actually was. The narrative is an often painful message of downward spiraling and expectations gone awry. 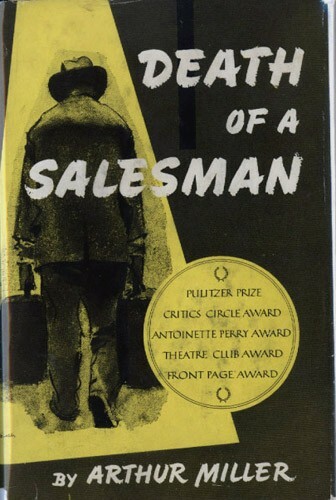 Sixty years ago, Death of A Salesman won not only the Tony Award but the Pulitzer Prize as well. Willy Loman, a late middle age tired and rundown traveling salesman (his sales area is New England) has not kept up with changing times and his own very human failings. This has badly effected his family's claims on the American Dream. This play is the classic modern American tragedy that sets fathers against sons, visionaries with dreamers and haves versus havenots. When done well, audience members squirm. A lot of people were squirming during this production. The minimalist set, gracefully created by Timothy R. Mackabee, added spatial imagination and visual economy that underscored an environmental bleakness reflecting the Lomans' lives. The lighting by Stuart Drake starkly accented the narrative flow. 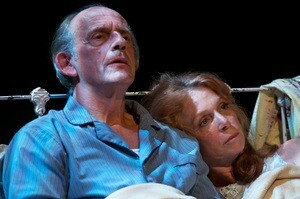 Christopher Lloyd brings a sad sack's sensibility to his characterization. He looks beaten down. His eyes are hollow, his face is haggard and his whole body is bent from Willy's lack of parental and professional success. His voice and movements convey frustration and inner turmoil. 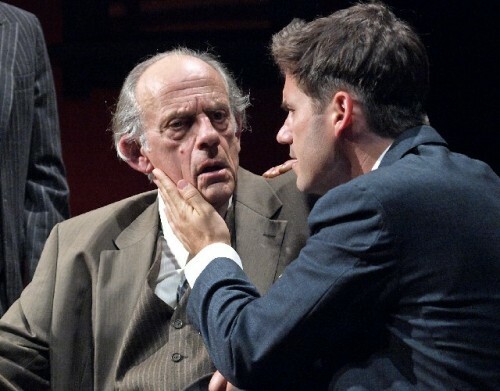 Mr. Lloyd is viscerally Willy Loman. Linda played brilliantly by Amy Van Nostrand is at once the core of the Loman family, the steadfast loyal but realistic wife and the disappointed mother. Amy Van Nostrand is tone perfect as Linda Loman. Biff and Hap seem like salt and pepper shakers, complementary characters that differ yet work together. Markus Potter's Biff is athletically gifted but morally flawed while Hap's brotherly love seems a bit more layered. Hap, played by Nathan Darrow, is a character drawn and acted more subtly with layers of humanity. All of the supporting characters are quite good. The best of them is Munson Hicks' Charley. His character is the antithesis of Willy. He is Willy's only true friend, yet Willy fights against his love and support from misdirected pride, jealousy and arrogance. Willy's obsession with greatness and achievement is intertwined with his personal and familial downfall. It is a tragic downfall that arises directly from his continued misconception of himself, even in his 60s, as someone somehow and in some way capable of eventual greatness and therefore prosperity. Willy's delusional tragedy is in his stubborn conviction that greatness stems directly from personal charisma or popularity. This is something that he just did not have. Death of A Salesman is a Greek Tragedy where the flaws of the gods are whittled down to the faults and obsessions of a somewhat delusional underachieving guy and his disfunctional family. 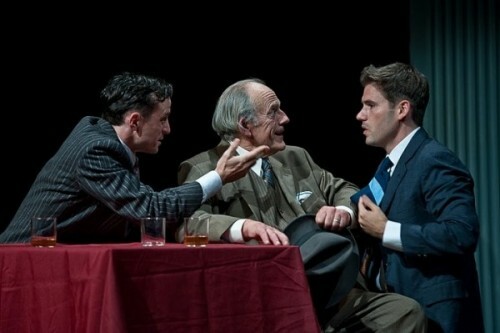 The genius of this Arthur Miller play is in its continued resonance. This production and its terrific cast are easily worthy of Broadway. Will this be its next stop? Bravo Christopher Lloyd and his cast colleagues. Bravo The Weston Playhouse Theatre. Bravo Roxbury Latin School.